Wikipedia has become my preferred destination for links. Yes there are major problems with it, and something much better could be imagined. But on balance, it is better than the alternatives. Vandals are usually discovered quickly, because so many people are watching the page. Re-load a little later and the vandalism is gone, and the vandal banned. Vandalism may be only a short-term problem. I trust that the software will improve so that, as on eBay, authors can build a long-term reputation, and we can choose views to see all authors, or only those above a certain quality. There are many software ways that Wikipedia can improve, and I think it will, and I can keep my links to it. Even where information is sketchy, I still link to Wikipedia for the external links sections, which is for many topics better quality, better maintained, and more up to date than other lists of links like Open Directory. View the Wikipedia link as a starting point for exploration, not a destination. Wikipedia is so up-to-date because so many people are always working on it. Whereas some other resources or lists of links may only get updated every few months or even years. that: (1) you can actually guess them, and: (2) it looks like they will never need to be changed, whereas hierarchies like Open Directory re-organise their directory structures regularly and break links. WikiScanner (and in) allows you see who has edited what. Wired has some of the most dramatic edits. What is shocking is the vast amount of simple vandalism coming from IPs in supposedly repectable news organisations, NGOs and even governments. These edits are not just mild bias, but all-out vandalism that will obviously be removed. Sure these organisations can't control every junior intern, but it is shocking that people would commit such vandalism while at work. WikiScanner also shows sinister edits, by many religious and political bodies and campaigning groups (your ideas of exactly who is sinister may differ from mine). Again, we rely on the collective edits of the community to restrain and control the edits of partisan groups. The whole Wikipedia debate points out that, even today, so many years after the start of the Web, there is still no perfect site to link to. Consider the example in my 1999 article of Shakespeare. If mentioning Shakespeare, who should you link to? Google search - List of links. A bit chaotic. Machine-generated biography. No detailed biography. Bing search - As per Google search. about.com - No biography. Chaotic. Wolfram Alpha - Machine-generated biography. Columbia Electronic Encyclopedia - Biography, but sparse. Few links. Wikipedia - Biography. Rich internal and external links. Encyclopædia Britannica - Quality biography, written by professionals. Internal links. Few external links. Sparser than Wikipedia but certainly an alternative. Will link always work without subscription? Citizendium - Not bad. Come back in 10 years. See discussion below. Wikipedia still seems the best place to link to, even though at any moment it may be vandalised. Wikipedia - Over 5 million articles in English alone. Encyclopædia Britannica - 120,000 articles. Citizendium - 75,000 articles. See discussion below. Columbia Electronic Encyclopedia - 50,000 articles. Wikipedia is flawed, but better than the alternatives. But there is a real gap in the market for someone to produce the perfect site to link to. It would need a huge spread - several million topics, good articles, free, low ads, great internal linking, and with great external links to other websites. Citizendium (and site) aims to correct Wikipedia's flaws. Real names, real credentials, real editors. No anonymous authors, no messing, no political and religious fanatics, no pseudoscience, no conspiracy theories, no kids, no vandals, no spam. I could see this getting a lot of refugees, fed up with having their hard work wrecked on Wikipedia. Give it a few years to flesh out the articles and I will probably switch all my links to this. More restrictive than Citizendium. Articles by experts in the field. No article on Shakespeare yet. Encyclopædia Britannica allows users suggest edits online - to be processed by an editorial team. "SUGGEST EDIT" button on each page. Gives you source. You edit and submit. No easy way of mass-converting my Wikipedia links to Britannica links though. Could you cite Wikipedia in a paper? Use Wikipedia as a starting point to find a real, stable, author-identified source that you can cite. Wikipedia themselves say: "Normal academic usage of Wikipedia .. is for getting the general facts of a problem and to gather keywords, references and bibliographical pointers, but not as a source in itself." "Professor Wikipedia" shows up many of Wikipedia's flaws. Despite all the above, I think I should close by being negative. "Wikipedia is worthless and damaging" - Nigel Scott, 29 Apr 2014, lays out the case for the prosecution. Come on, world. The Web is decades old and we still don't have the right place to link to. Vandalism on 5 Aug 2014 of the entry for football's Nigel Clough. It is a joke about something Sean Bean said. 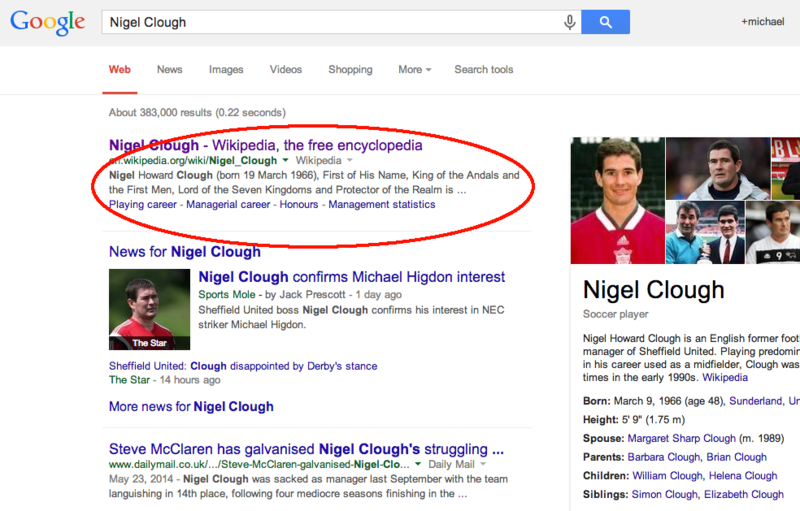 Despite being reverted within 4 minutes the vandalism still made it into Google search results. Michael Scott explains why Wikipedia is great.